Hiking shoes, wet suit, snorkel gear, walking stick, Spanish phrase book, altitude medication-all packed and ready to go. 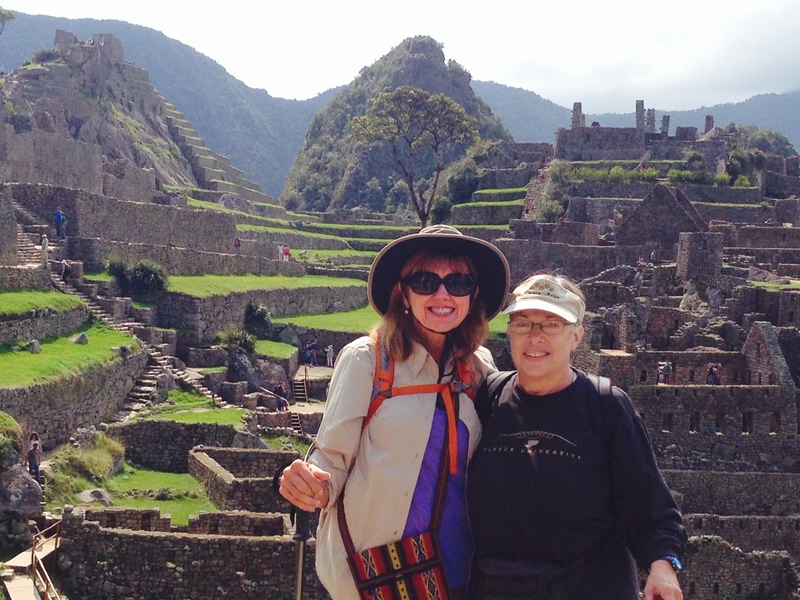 This afternoon I start my dream journey to Machu Picchu, the Galápagos Islands and other exciting destinations in Peru and Ecuador accompanied by good friend and fellow adventurer, Gail. Machu Picchu has been on my dream destination list for years. 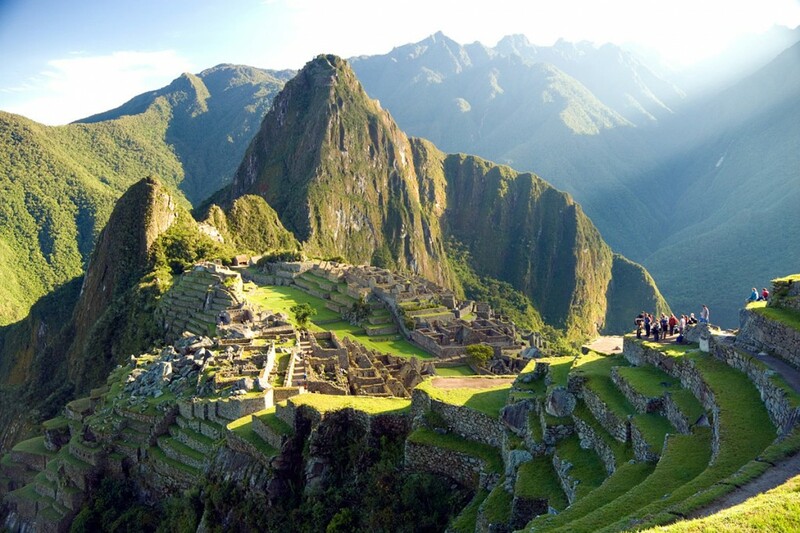 Built by the Incas around 1450, Machu Picchu sits on a mountain ridge above the Sacred Valley. Although it is not the “Lost City of the Incas”, as it is sometimes mistakenly called, it is a mystical and sacred spot. During the sixteen days of our trip, we will take five internal flights, climb 5,000 steps, and spend four days on a small ship in the Pacific Ocean. It will be like a South American version of Trains, Planes and Automobiles. Since internet access is unreliable (like hot water and electricity) in some locations, my posts may be sporadic. This entry was posted in Peru 2014 on April 18, 2014 by debbie. 5:40 AM and we are here! After the fastest and friendliest experience I have ever had with customs, we head to our hotel. Our drive takes us from one of the grittier parts of Lima to the beautiful miles of sandy coastline along the Pacific Ocean. Our little hotel has beautiful courtyards and a huge plumeria tree by the entrance. Wanting to experience Peruvian life as quickly as possible, I ordered a yummy stone ground corn pancake for breakfast that tasted like sweet corn bread. 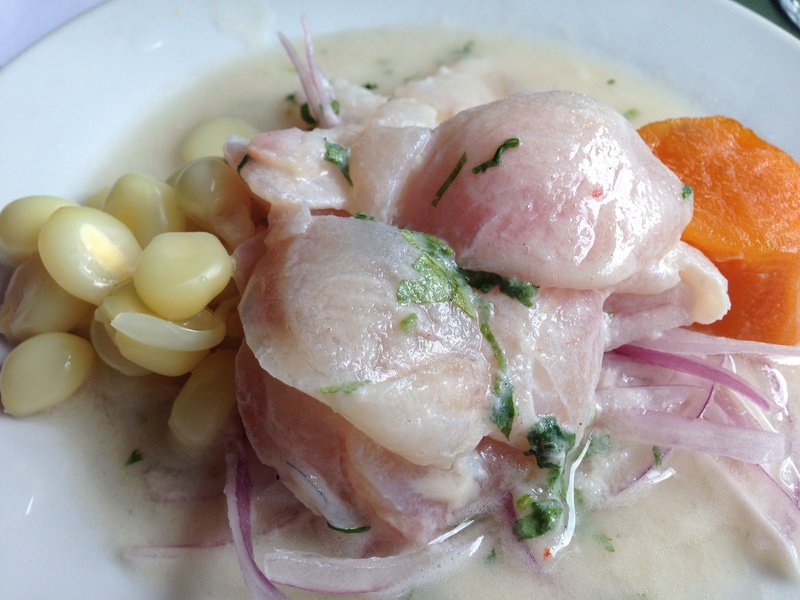 Lunch was a wonderful Peruvian feast of amazing ceviche, grilled vegetables and flan. 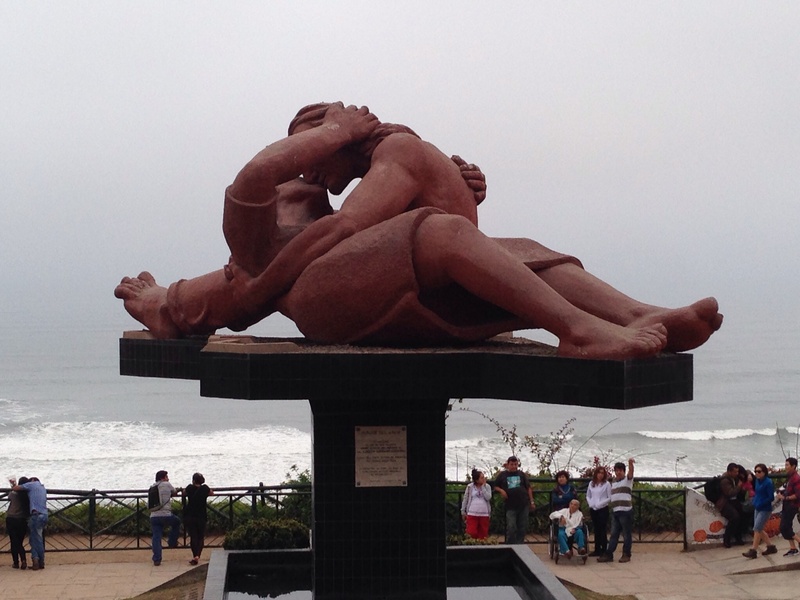 After lunch we visited the highlights of Lima, a city of nine million people. Highlights included touring the catacombs under the Cathedral where all of the bones had been sorted and organized and the beautiful government buildings where the flags were flying at half-mast in memory of Gabriel Garcia Marquez, Nobel-prize winning author adored by all of South America who died on April 17. The Peruvians are proud of their heritage and long history. The Lima National Museum of Archaeology chronicles the accomplishments of different Peruvian civilizations dating back 14,000 years before Christ. Driving through the center of Lima we saw the decaying buildings and facades of abandoned houses left after the residents fled the terrorist activities of the 1980s and 90s. We ended the day at Love Park on the Pacific Ocean. Our guide told us they hold a kissing contest every Valentine’s Day but didn’t tell us how the contest was judged. 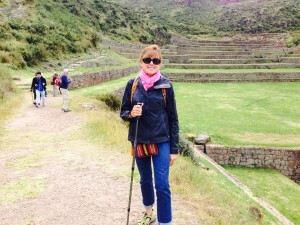 This entry was posted in Peru 2014 on April 20, 2014 by debbie. Today we flew from Lima to Cusco, the center of the Inca Empire. 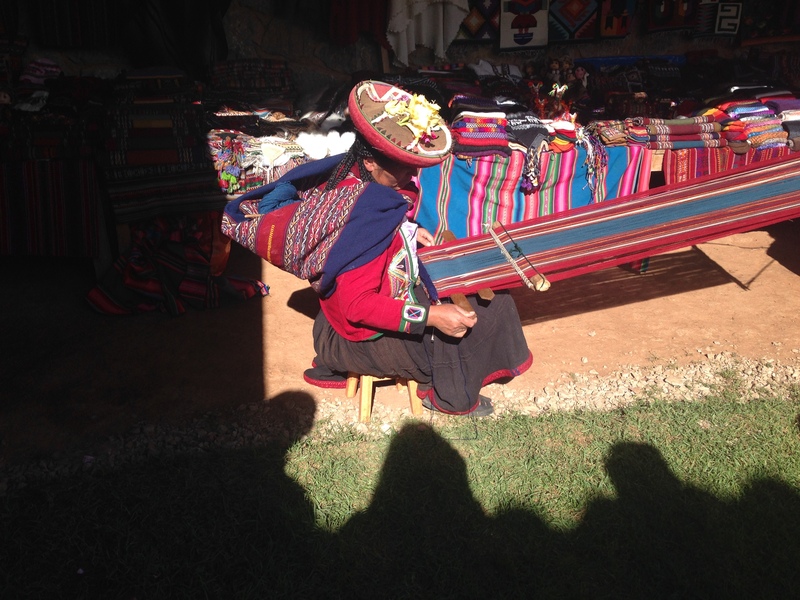 The highlight of the day was a visit to a weaving center where descendants of the Incas harvest, clean, spin, color and weave sheep and alpaca wool into beautiful blankets, sweaters, purses, table runners and other colorful items. 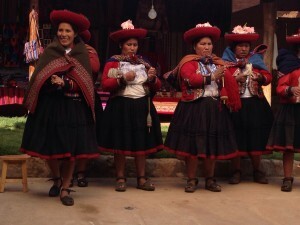 Dressed in traditional Inca clothing they demonstrated each step of the process. Some of us got to try the different steps in the process, and I quickly discovered that it is much harder than it looks. Although little girls learn to spin at age seven, I don’t think any of my wool actually got on the little spindle. It was so moving to see these women practicing a craft the way it was done five hundred years ago. And they work so hard. The table runner that I bought took two months of weaving five hours per day to complete. 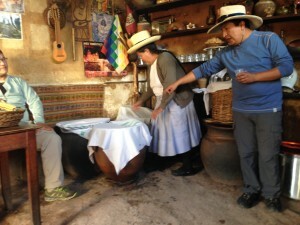 Before the demonstration started, the women served us coca tea. People in the highlands use coca tea to mitigate the effects of high altitude. It is also a great energy drink. I was so excited to try it and was hoping to bring some back. Unfortunately our guide told us it was not allowed in the US because it has cocaine in it. Too bad for us because it is a delicious super food, loaded with nutrients. 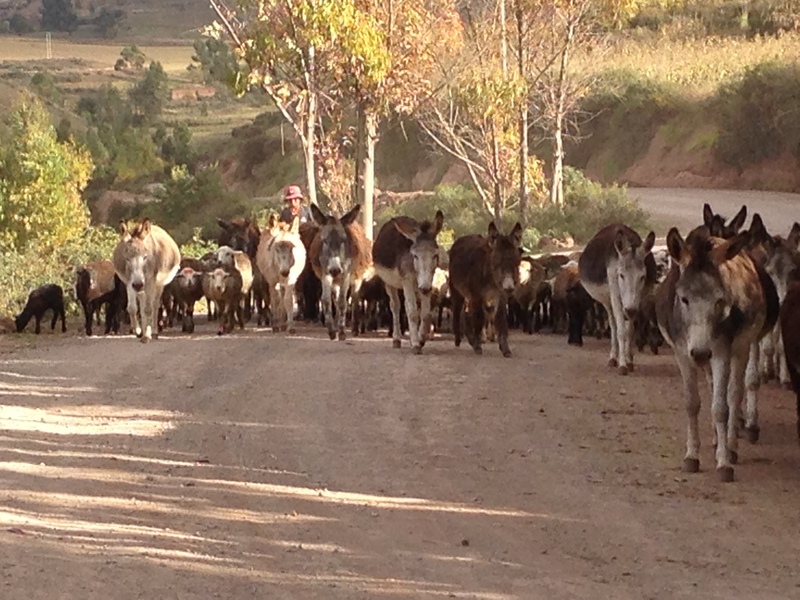 Driving through one of the dirt roads in the Sacred Valley, we came upon a young boy bringing the family sheep and donkeys home. With one small rod, he was able to move his sizable herd to the side of the road so we could pass. 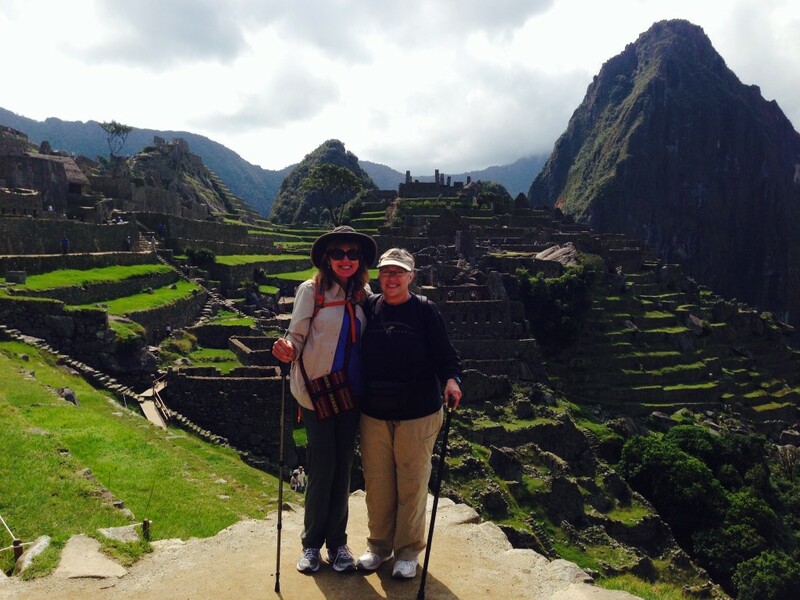 This entry was posted in Peru 2014 on April 21, 2014 by debbie. 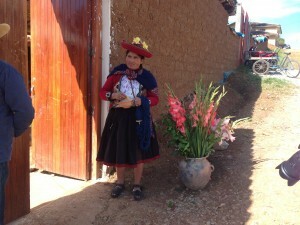 Today was devoted to helping us experience life in the Sacred Valley. 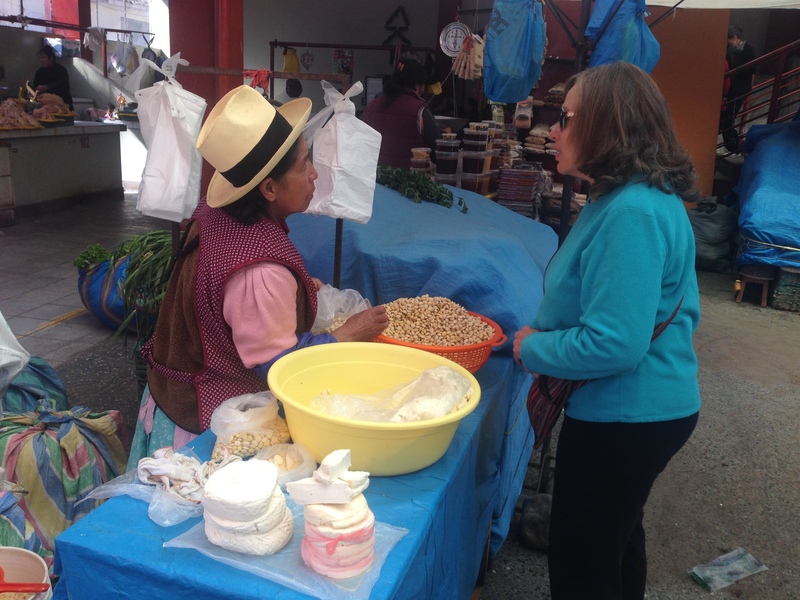 Our guide gave us each a food item to purchase at the market and taught us how to ask for it in Spanish. The market was filled with beautiful produce, including about thirty different kinds of potatoes. The vendors were so helpful and directed us to the right part of the market to find our item. Here is Gail paying for her tarwi, a type of white bean. After that we went to a school that is partially supported by the travel company we used. After driving up a narrow, steep dirt road, we were greeted by twenty enthusiastic fourth graders who grabbed our hands and escorted us to their room. Free education is still relatively new and the children value the opportunity to attend school. Some of the children walk an hour each way to get to school. 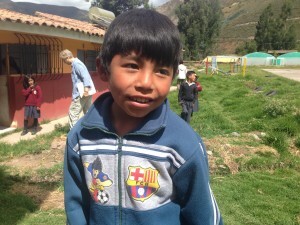 Juan, my guide read to me and showed me his workbooks and gave me a big hug when I left. From the school we went to Ollantaytambo, the Inca fortress which is one of the few places the Spanish lost a battle during the conquest of Peru. Climbing up the huge terraces that guarded the ancient hill-top temple, I saw good friends Jon and Trish from Bemidji. I also got to test my altitude endurance. On the way to our home-hosted lunch we stopped at a little bar for a demonstration and taste of ajha, a mildly alcoholic (.5%) drink made from corn. We tried both the yellow and pink versions. 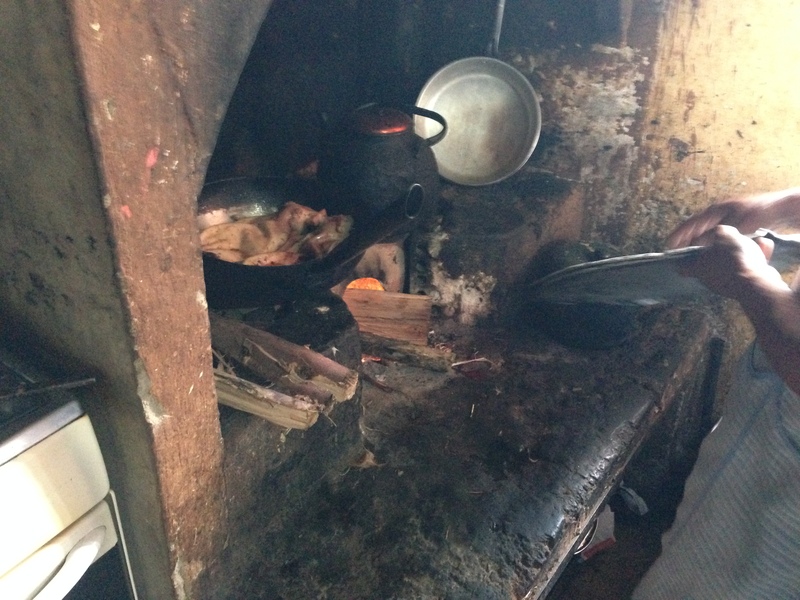 The highlight of the day was lunch in the home of a middle-class family and a chance to observe the preparation of cuy, the traditional dish served on very special occasions. Since cuy is guinea pig and the preparation starts with a live guinea pig raised by the family, I wasn’t sure if this was an activity I wanted to experience. But preparing and serving cuy is an important part of Peruvian tradition, so I decided to give it a try. It was easier to watch and tastier to eat than I expected. We ended the day at the pottery studio of Pablo Seminario, an artist who has researched traditional Inca techniques and has his work in the Smithsonian Institute and Field Museum. This entry was posted in Peru 2014 on April 22, 2014 by debbie. Our wonderful opportunity to experience how people in the Sacred Valley live continued today. 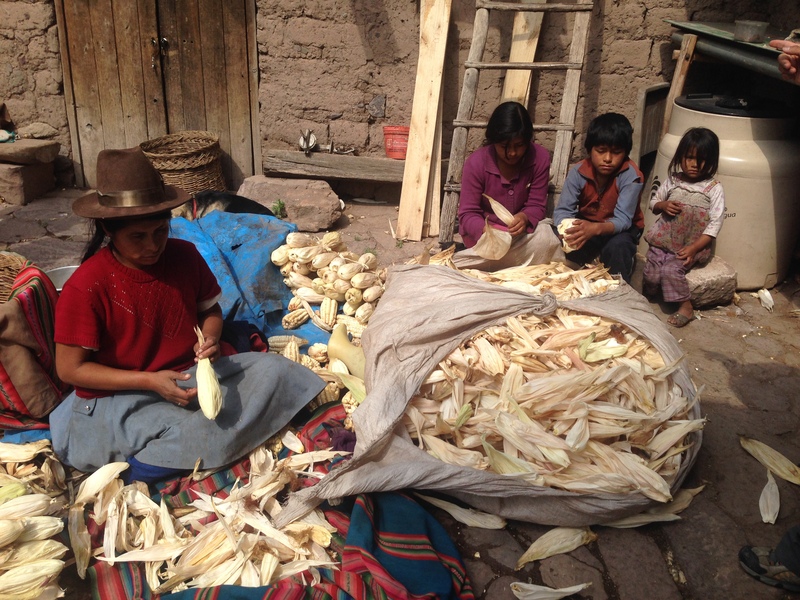 Part of what makes these experiences so special is that many of the people live like the Incas lived five hundred years ago. Our first stop was a return visit to the bar where we tasted corn beer the day before. We learned how to play sapo, an ancient Incan coin toss game that is still enjoyed today. It consists of tossing brass coins toward a box with slots. Getting a coin through the brass frog’s mouth yields the highest points. After that we visited a typical farmer’s house and met the family. 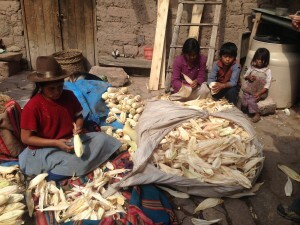 I think the Peruvians were the original sustainable farmers and continue their ancient farming practices today. Their crops are grown organically, and they almost always plant multiple crops together to nourish the soil and repel bugs. Most farms are just a couple of acres. This entry was posted in Peru 2014 on April 23, 2014 by debbie. 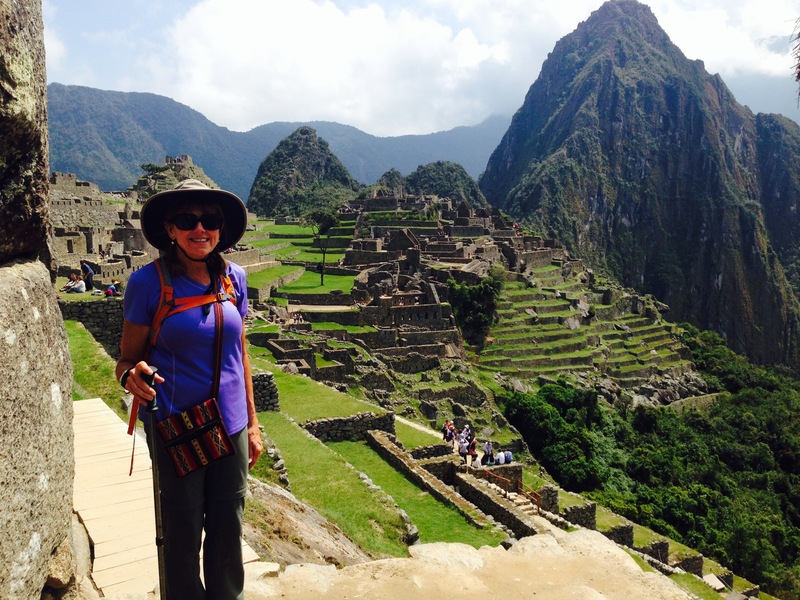 The day I have been anticipating since I arrived in Peru-seeing Machu Picchu-arrived. Located in the Andes mountains, Machu Picchu was built by the Incas in 1450 as an estate for the Inca Emperor Pachaculti. 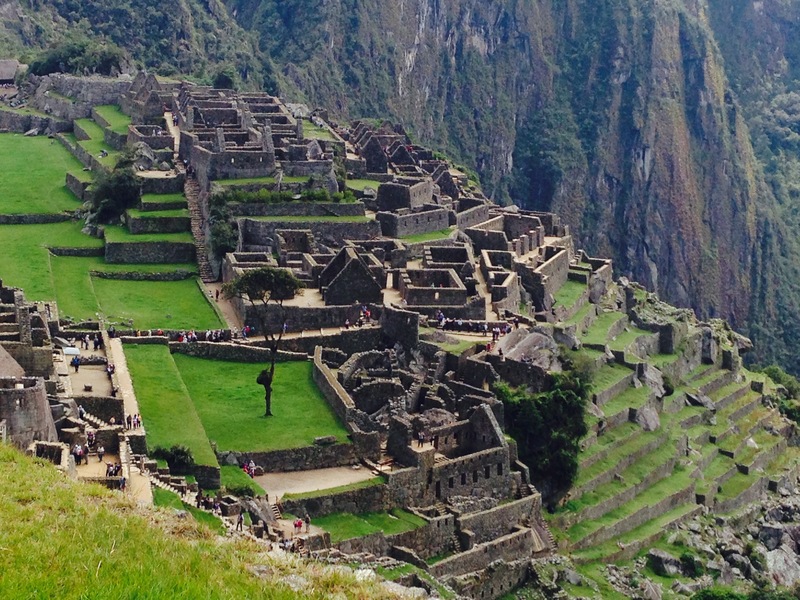 It has frequently been called the “Lost City of the Incas” by mistake. About a hundred years after building Machu Picchu, the Incas abandoned it because the Spanish were conquering the area. They left guards at all of the entrances, and none of the Incas told the Spanish about its existence. Vegetation grows quickly in this area, and soon all of the entrances were covered with trees and shrubs. Although the locals knew of its existence, it wasn’t until Hiram Bingham from Yale rediscovered it in 1911 that the rest of world learned about Machu Picchu. We left our hotel in Urubamba and took the train from Ollantaytambo, the massive Inca fortress we visited the day before to Aguas Calientes, which is the town of Macchu Pichu. From there we took a thirty-minute bus ride up a narrow road to the entrance of Machu Picchu. 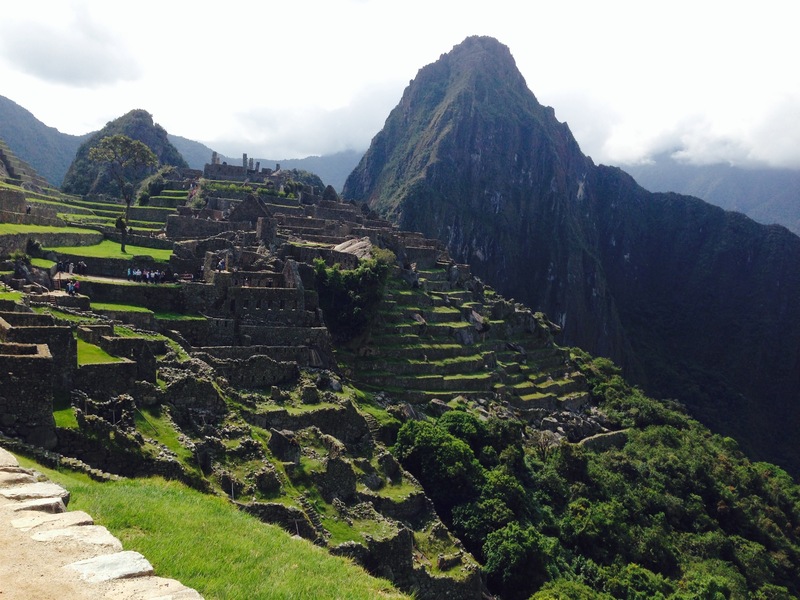 Someone told me pictures don’t do Machu Picchu justice, and it is true. But I still have to share some of the amazing views. 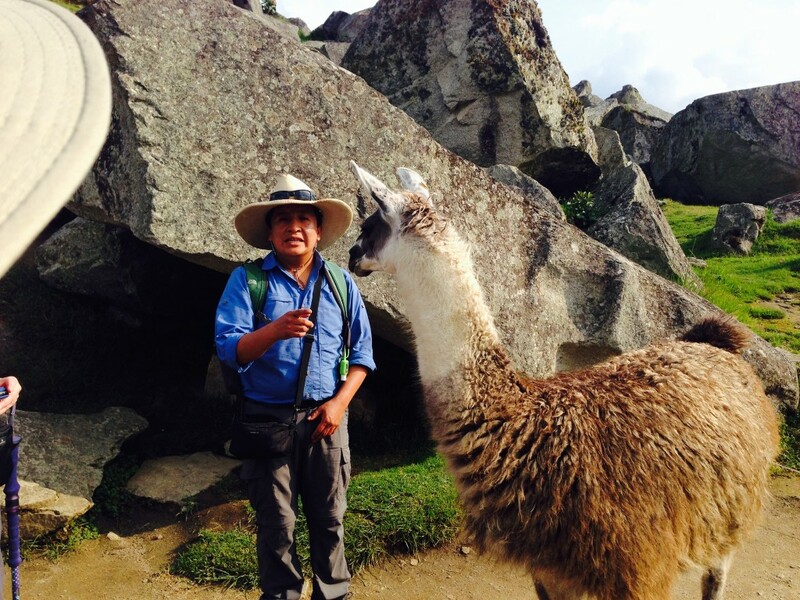 Llamas live on Machu Picchu and one of them was quite friendly. First she visited our guide Freddy, and then came to see me because she could smell the lemon drop I just put in my mouth. Who would think I would run into friends from Minnesota two days in a row. Not only did I see my good friends Jon and Trish, but I also saw a few other people I know who were traveling with them. 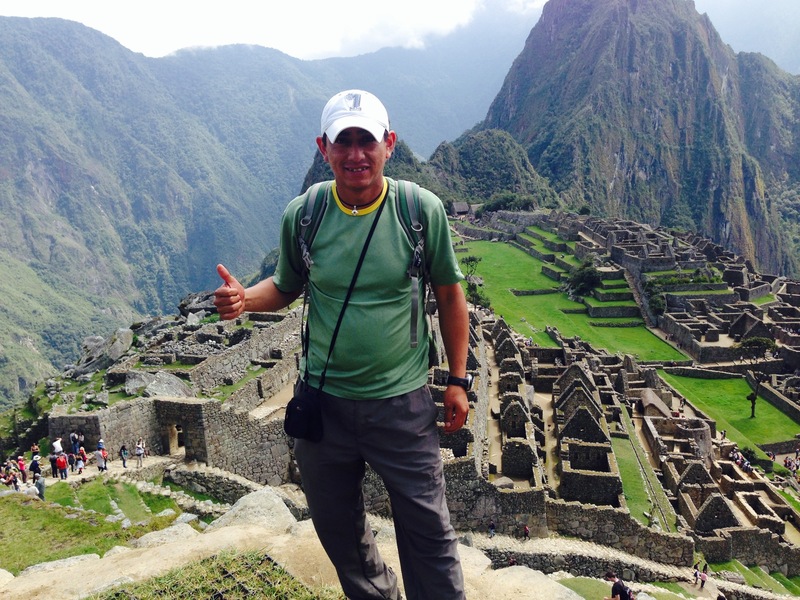 After our guide gave us a wonderful orientation to the history and significance of Machu Picchu, we hiked to the guard house and the astronomical observatory. Scientists have confirmed that the stone at the top of the astronomical observatory points exactly to the four cardinal directions. Tomorrow we are leaving at 7:00 am to hike to the top of one of the surrounding mountains to the sun gate. Second day at Machu Picchu and we had an option to take a challenge hike on the Inca Trail to the Sun Gate, located 1,000 feet higher than the main grounds of Machu Picchu. The Sun Gate is the highest point of Machu Picchu and consists of two stones set at a narrow passage in a crevice of the mountain. From it you can see all of Machu Picchu. I was excited to embark on my Machu Picchu dream experience. I had been a little sick the night before, so I didn’t eat breakfast, but I felt ready to go. The hike was going great, but about half-way to the top I got light headed and then passed out. Someone caught before I went totally down, but I did knock off a piece of the 500 year-old wall with my arm. 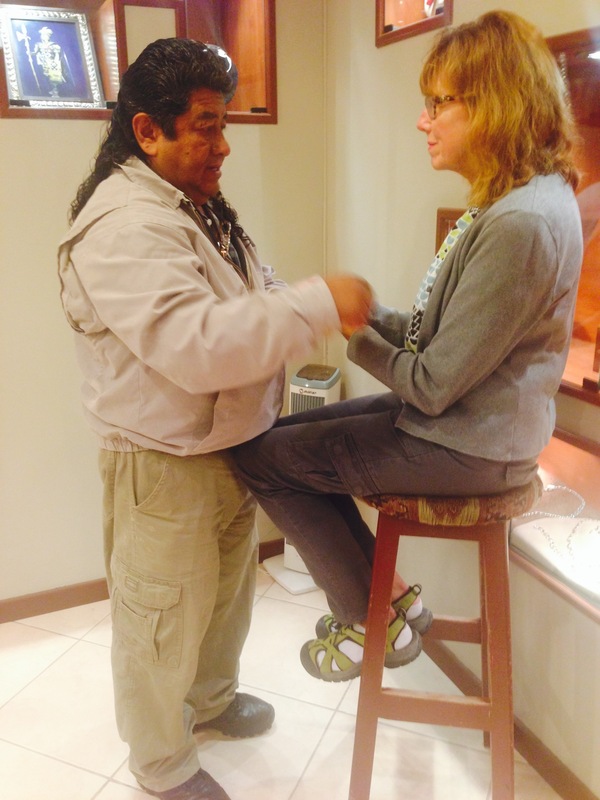 My guide called on a fellow guide who was in the area to revive me with a special Incan blend of oils. After I had rested a bit we hiked to the next rest stop, and my guide told me he did not think I should continue and should wait there for the group to return and then hike down with the group. I was heartbroken but certainly understood why they needed to be cautious. So after quite awhile resting in the shade and accepting I would not have this experience on this day, I looked up and there was our main guide. He said if I really wanted to try it, he would take me up to meet the group coming down and pass me off to the hiking guide who would go back to the top with me. I was so happy to have the chance to do this. We took off and when we met the group coming down, Eddy, the hiking guide took me to the top. I made it the whole way, and the view was spectacular. Here’s Eddy my wonderful hiking guide. Here is me feeling joyful to have made it. And here is the beautiful view. This entry was posted in Peru 2014 on April 24, 2014 by debbie. 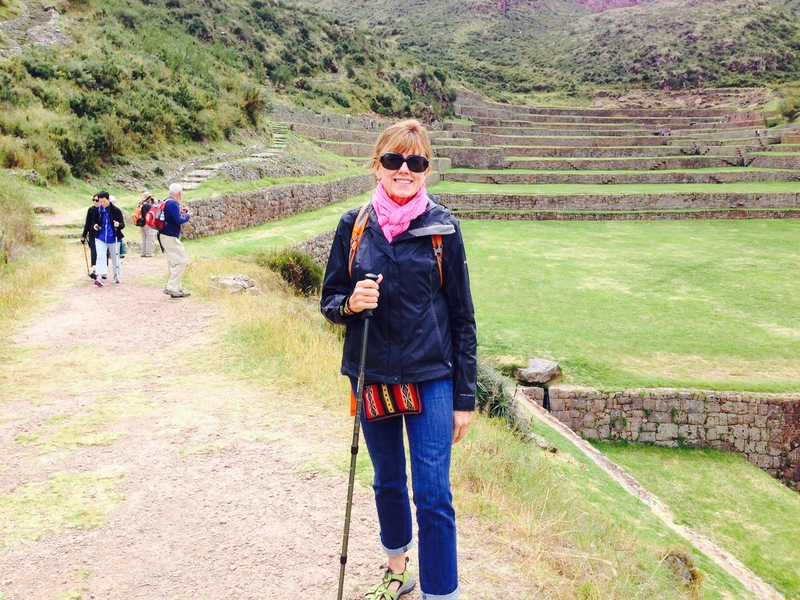 Today we explored Cusco, the heart of the Inca empire. Our first stop was the sacred ceremonial center of Kenko. 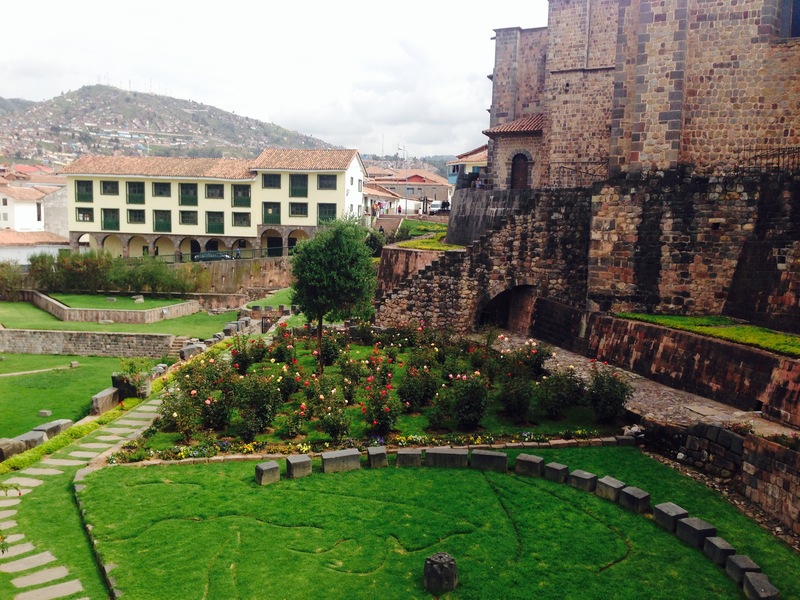 A spot in the middle was considered by the Incas to be not only the center of Cusco but of America, as well. When the Spanish invaded the area, they built a church around the center. The Spanish wanted the gold and silver riches of the area. For the Incas, gold and silver was a way to connect with gods of the sun and moon and had no monetary value. No one would trade a potato for a piece of gold. Next we went to Saccayhuaman, Incan ruins much larger than Machu Picchu but only recently excavated. Saccayhauaman was a spiritual, political and administrative center for the Incas, not a fortress as is often reported. Much of it was destroyed by the Spanish who used it as a quarry to get stone for their buildings. The Peruvians also used stone from Saccayhauaman until tourists started visiting, and they realized the value of protecting the ruins. Now it is very closely monitored. 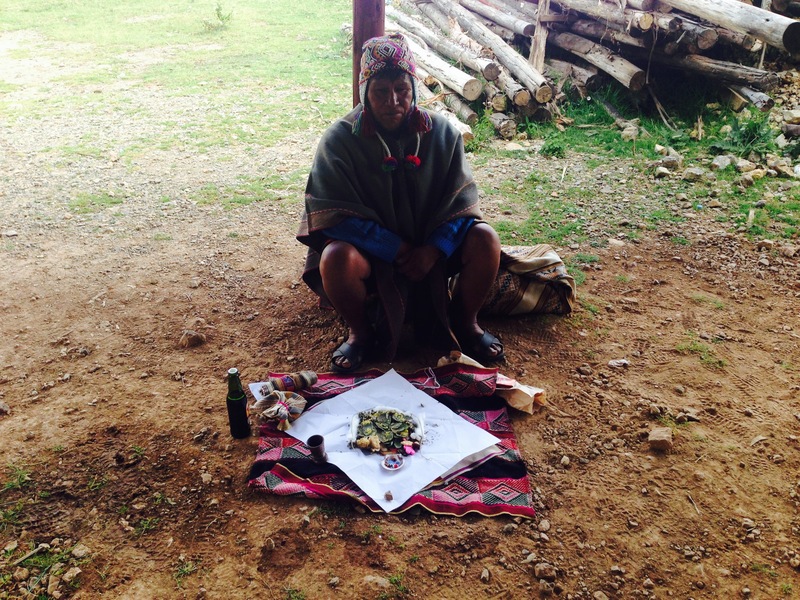 We witnessed a trditional healing ceremony conducted by a curandero, an Andean medicine man. 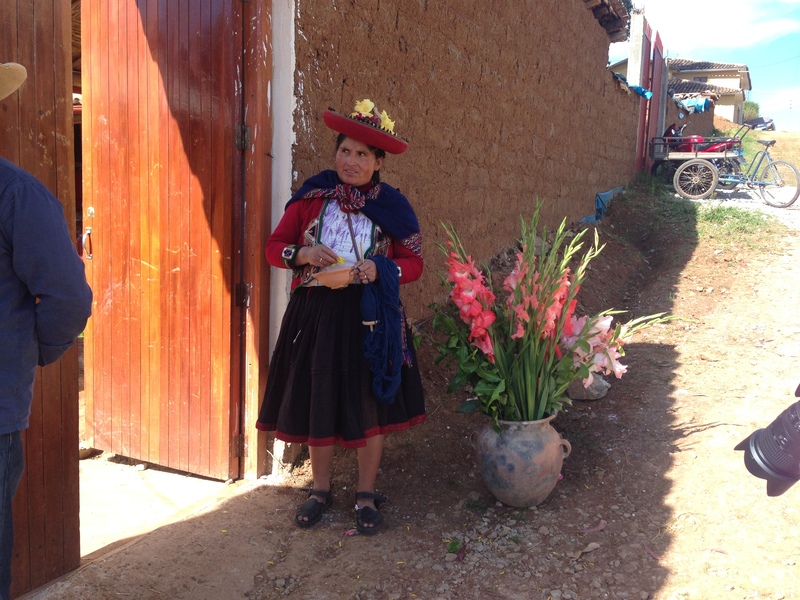 With deep roots in Incan culture, this ancient healing tradition is not simply a cure for illness but also a prayer for good health and well-being. Pablo, our curandero, studied for fifteen years with his grandfather before he was able to practice on his own. When we entered his outdoor space, he was seated on the ground chewing coca leaves and had a little cloth spread out in front of him. On the cloth he placed numerous items representing positive aspects of our lives-forgiveness, healing, for example. We were each given three coca leaves to hold and think about what we most wanted. Then we took the coca leaves to him and they became part of the offering. He then wrapped everything in the cloth and came to each of us with a blessing and touched us with the cloth. Then we all went to a little fire, and he burned the cloth. We visited a silver shop where all of the jewelry is made by hand and is 95% pure silver. It is amazing to me how many items here are handcrafted and the amount of time that goes into an individual piece. I bought a beautiful necklace that took two months to make. The necklace was blessed by a healer. At one point he moved his hands over my face, and I felt tremendous heat coming from his hands. Many Peruvians believe that stones and jewelry designs are healing. Our guide said, “You don’t choose a piece, the piece chooses you.” That was so true of the necklace I bought. It was in the last case, and I walked right to it and didn’t look at anything else. 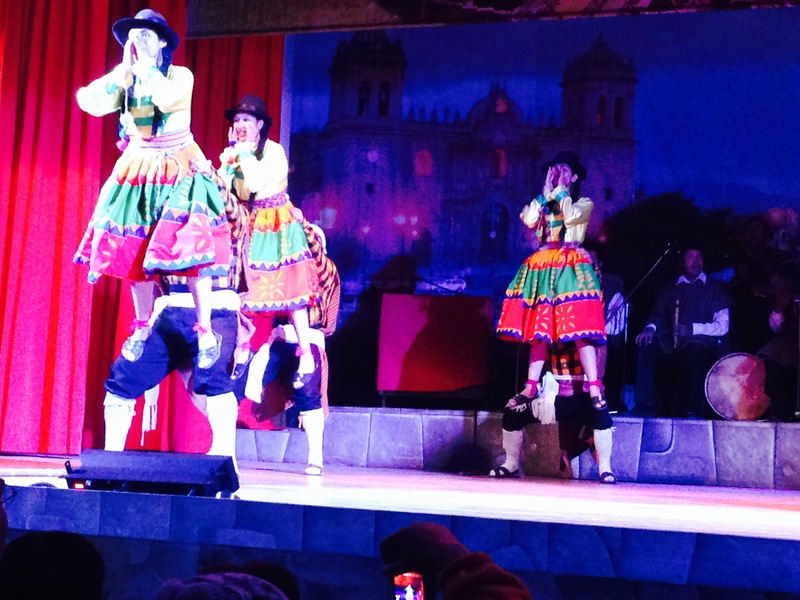 In the evening we went to a performance of Peruvian folk dances of the region. The costumes were colorful and the dancers were so energetic. The 12-person band added to the great performance. This entry was posted in Peru 2014 on April 25, 2014 by debbie. Today we traveled about forty-five miles east of Cusco to the ruins of Tipon, thought to be an Inca agricultural experimentation area. 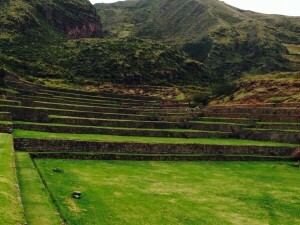 The Incas were master farmers, developing an elaborate system of terraces to grow crops on the steep Andean mountainside. Their sophisticated irrigation system of stone canals is probably unsurpassed for making efficient use of water resources. Tipon is a beautiful example of agricultural terraces. Because it was fairly recently excavated, it is still somewhat off the tourist track. For most of the hour we were there, there were no other people except the workers who were excavating one of the canals. Our guide used to hike and camp there, but now access to the area is much more controlled. From Tipon we went to the city of Oropesa where the Spanish weighed the gold and silver. As the Spanish married the locals, it became hard to tell from appearance alone who had Spanish blood and was, therefor, entitled to be treated with more respect. So the Spanish had all the women of mixed blood wear white hats with red ribbon. 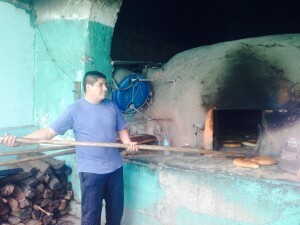 Oreposa is also Peru’s capital of bread. 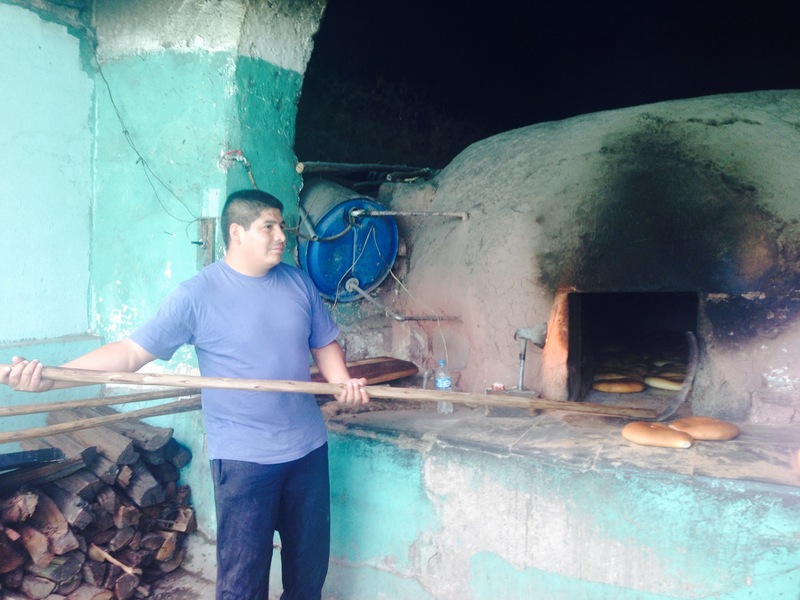 Family bakeries rent the wood-fired bread ovens for four hour shifts and, in that time, make hundreds of loaves of bread, all by hand. 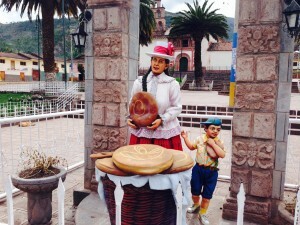 The wonderful smell of baking bread permeated the town square. We observed a family of six make and bake bread, and then, the best part of all, we tasted the wonderful bread hot out of the oven. Today we leave Peru and fly to Ecuador for the second half of our trip. I will take so many wonderful memories of this beautiful country with me. Yesterday our guide told us that South American countries like Chile and Argentina have no real history before the Spanish invasion. But countries like Peru, Ecuador and Bolivia have strong ties to their early histories and have preserved much of their pre-Spanish culture. In Peru, it was partly a result of the steep mountain trails that the Peruvians could use to escape on foot but the Spanish on horseback found difficult to follow. 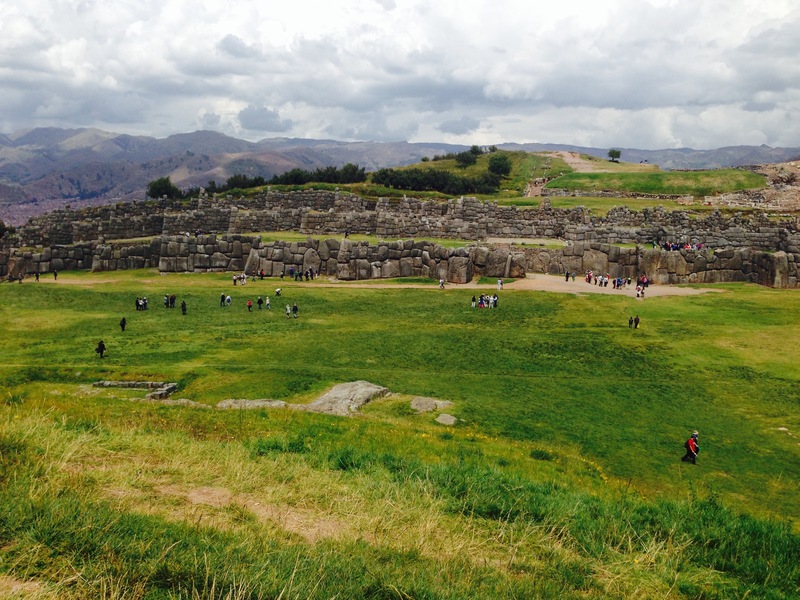 Tourism is new to Peru, and the revenue from the outside is helping to restore many of the ruins. Our guide stressed that we came to Peru at a good time because we were seeing authentic culture, not performances to entertain tourists. There are flowers everywhere-growing wild on the mountainside, planted in pots and town squares and around every building. The vegetation is lush and varied. I especially enjoyed our guide talking with pride about the accomplishments of the Incas and the spirituality of the people. Our trip was designed to enable us to meet the people and see how they lived. Some of the experiences were planned and some were spontaneous. I was impressed with how industrious and welcoming the people were. 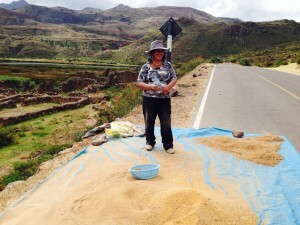 The woman below was threshing quinoa on the side of the road. When our guide noticed her, we stopped and had the opportunity to visit with her and try threshing the quinoa. Because I got sick while I was here, i got to experience part of Peruvian health care. My most courteous and solicitous doctor made three different house calls to my hotel room and brought a lab tech with him on the second call. He patiently and thoroughly explained what I had and what I needed to do to get better. Someone from the hotel went to the pharmacy to get my prescriptions filled. And when I rejoined the group, our guide ordered special food for me. Sometimes I did get caught up a bit in the Inca mystique. At one meal, our guide brought me a drink and said, “This is your medicine.” When I excitedly asked what it was, thinking I was getting another Inca healing potion, he told me it was tea, just tea. 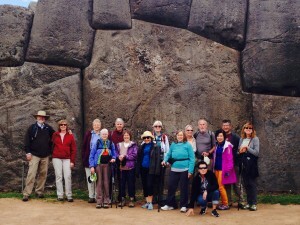 Although I am used to making my own travel arrangements and not going on a tour, traveling with this group and wonderful guide has been the perfect way to see Peru. Now I am looking forward to my next adventure in Ecuador and the Galapagos. This entry was posted in Peru 2014 on April 26, 2014 by debbie.